Is a Saxon Orgin violin what dose that mean ? To my understanding, Antonio used failrly contemporary wood, like modern makers. 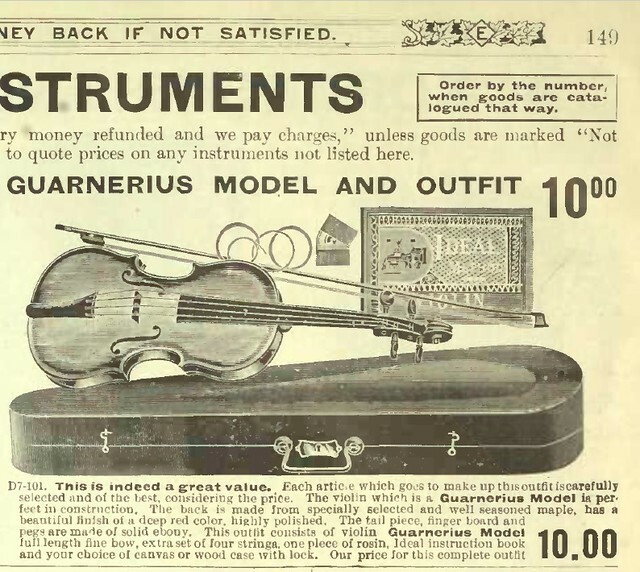 The Germans were at one point around 1900 importing 30,000 violins a year into the US. In the same time the Italians accounted for something like 600, annually. A friend of mine once added up all of the golden-period Cremonese violins he could imagine in existence currently, and came up with a number something like certainly fewer than 2000. We like to disparage the old factory instruments because they're often crude inside where you can't see--graduation with a gouge, carved out bass bars, blocks lacking--but the people who made them were skilled, and some of these instruments can be externally very attractive. If the model used was fundamentally proper, once set up properly, the good ones can certainly sound fine. Just for fun, from a 1909 T. Eaton's catologue (Canada's version of Sears) courtesy Canadian Archives. These guys, the catalogues, were the Amazon of their day. I assume this is the source for many (most) of the ones we see today that Ken's talking about. For reference, average worker income in those days was about $30 per month. 1500 miles from home work or starve not like today . Interesting to keep in mind that the industrial revolution took us from aggrarian to urban cultures, and those of the "old world" that came to the "new world" during that time brought with them ideals of success that included a home in town, a regular paycheck, and children that learned to make music, often violin and piano. Rapidly expanding market here, high demand for the better things in life. Yeah, Kinda like the demand for I-phones today. Also, in 1600 the world encompassed about 500 million souls, now about 7 billion, that's 14 times as many people. 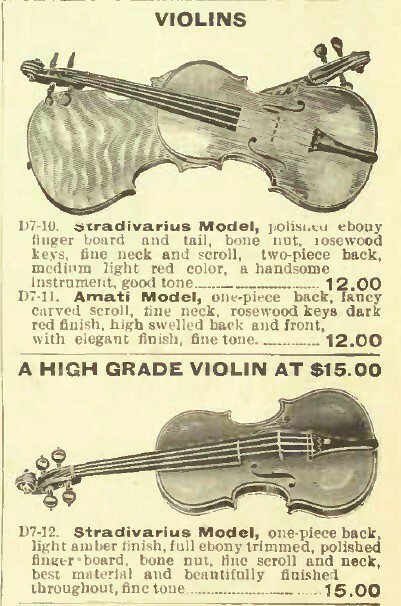 If there weren't enough Strads to go around in 1600, it is now 14 times rarer, good news for us! China was estimated at 1.2 billion in year 2000, and now estimated at 1.4 billion or more, that's an increase of 200 million. Most are moving (again) from agragrian villages to industrial and urban locations, more contact with western music, and again, a demand children to learn music of all sorts. The big question, do they absorb most of the violin production of their own industry? Or will these early Chinese instruments get reimported as antiques? What impact on the demand in China for western made instruments? Interesting question. I have always joked that the center of the violin world has been constantly moving west for hundreds of years--from Italy, to France, to England, across to the US, then over to Japan, Korea, and China in that order. 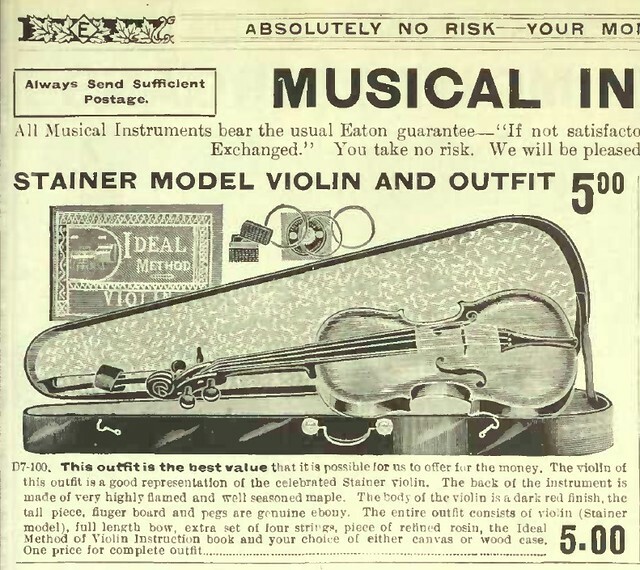 In that vein, I am predicting the next boom in violin making will be in India, then a few more countries east of India over a couple of hundred years, and that eventually the center will once again hover over Italy, coming from the east. I read up on this quite a bit last year, but this article does a good job of explaining some of the back story. By the way Ken, I have similar memories of the old Eaton's catalogues. But if we go much further we'll likely be asked to NOT share anymore!! I have, right now, one of them, opened. 3/4 from Markneukirchen/Schonbach, with the inside of the top just like you described. But, measuring the thickness of the top between the bottom of the channels made by gouge and the top surface, one could find that the graduation lays within the ballpark. I opened it because of the unglued neck block and after a little scraping of the hills of gauge's traces (without the bass bar replacing game), I think I could finish with rather usable instrument for some young artist.